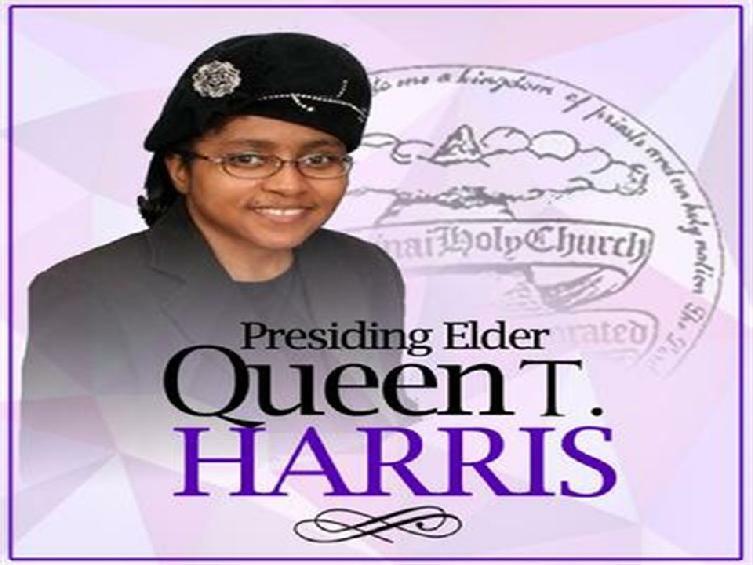 Presiding Elder Queen T. Harris, M.Div., is a native of Louisa County, Virginia, where her spiritual roots were established in the Baptist Church. Growing up humbly with her parents and three other siblings, she comes from a family of multi-talented people and always strove for excellence in all that she endeavored to do. Serving the church has always been an important part of her life, and over the years the Lord has anointed her to serve the church in various capacities. She answered her call to ministry in September 1996, and preached her initial sermon in November of the same year. After serving as a staff minister for one year, she was ordained by the board of presbytery as an Elder in November 1997, and appointed as the Assistant Pastor of Fountain of Deliverance Outreach Ministries, Richmond, Virginia in July 2000 under the leadership of Senior Pastors, Bishop Lawrence & Elder Stephanie Taylor. In September 2010, she was appointed by Mt. Sinai Holy Churches of America, Inc. as Interim Pastor for the Mt. Zion Pentecostal Holiness Church in Norfolk, Virginia, and was installed as the Senior Pastor in October 2011 under the leadership of the Southern District prelate, Bishop John Emanuel Holland. During the same convocational year, Elder Harris was appointed by the Executive Board of Mt. Sinai as the Presiding Elder for the State of Virginia; serving fifteen churches across the state. Subsequently in September, 2013, she was appointed as a member of the national Board of Presbytery, and in September, 2016, she was appointed as the Corporate Financial Secretary as well as a member of the Mt. Sinai Board of Directors. In addition to her duties as a financial officer, Elder Harris was most recently promoted to an executive office as the organization's Business Administrator as of September, 2018. Presiding Elder Harris is a graduate of the Samuel Dewitt Proctor School of Theology@Virginia Union University in Richmond, Virginia where she received a Master of Divinity Degree in 2003. During her seminary tenure, she also completed a six-month internship at the First Baptist Church – South Richmond, where the honorable Rev. Dr. Dwight C. Jones (former Mayor) is Pastor. Elder Harris is gifted with a uniquely gentle, yet powerful ministry that is a combination of sermon and song. With it, she has touched the lives of thousands of people, not only by her messages in sermon, but by the anointed messages that she has ministered in song. With a heart of compassion for the poor and oppressed, she has humbly and sacrificially served her local community and abroad, with her gifts and a vision to lift “the least of these”. She is the mother of a lovely daughter who serves faithfully by her side. In addition, she has made notable contributions to local charities, as well as to the community at large. Abroad, she has studied, toured, and ministered in parts of Ghana, West Africa, Georgetown Guyana, South America, and New Orleans, Louisiana; the latter of which she participated in an organized effort to help restore the livelihood and economic independence to those affected by the devastation of hurricane Katrina. An avid supporter of her alma mater, Elder Harris served as a preliminary committee member for the newly founded Center for African American Pentecostalism & Leadership Development at Virginia Union University in Richmond, Virginia in 2016. In addition, she actively serves as a Master Teacher for Alabaster Women’s Ministries. Headquartered in Washington, DC, AWM is a para-ministry that specializes in ministry to the physcological, emotional and spiritual health of women from every walk of life with a goal of promoting Christian growth, stability and leadership.